Make quick work of vegetable peeling with the spiral vegetable slicer you can core and slice an entire apple in no time having enough done in minutes ready for a delicious pie. This slicer is great. I love it. My favorite food is pie! I enjoy making great pies. My daughters favorite is apple pie, the kind made with fresh apples. The only thing stopping me from making more apple pies on a regular basis is peeling, coring and slicing all the apples needed to make a homemade apple pie. I found the solution, its the spiral slicer you can see just below. I was skeptical because if is priced low and made of plastic. I thought what have I got to loose. I bought one putting it to the test. It passed. In fact turns out I like the fact that it's plastic, it's lightweight yet a sturdy product that's easy to use and clean. Just toss it in the dishwasher. I was tempted to carve up the entire bag of granny smith apples I was using when I used it for the first time. We can't eat that many pies so I made myself stop. 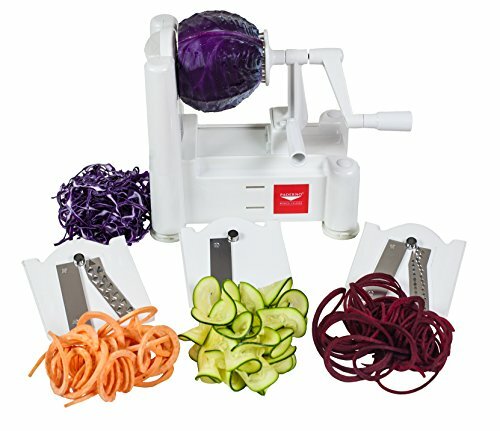 This handy dandy little slicer makes slicing the veggies and fruits you use everyday both fun and easy. The fact is most of us often pass on the fruits and vegetables were supposed to eat because we don't want to take the time to slice and peel them. With this peeler/slicer it's a snap. Simply clean the apple or potato you want place it onto the end prongs securing, push the base toward the blade, crank and in no time it is sliced and peeled perfectly. This tool comes with 3 different types of blades to create fancy patterns and designs. The straight blade creates ribbon cuts while the others can be seen above. Its backed by a one year warranty and is dishwasher safe. 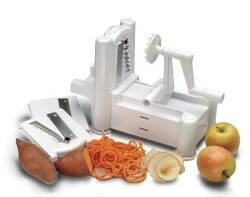 The uses for the spiral slicer and peeler are endless. Check out this apple that just came off the slicer. I only needed to make one cut or slice down the middle and in a flash I have the perfect addition to any pie shell. I like the size of the slices, I can pile them up making one of those fine layered pies bursting with apples. Potatoes are so versatile and something most everyone loves. The one thing keeping us from cooking with fresh potatoes more is the peeling and slicing. This makes it so easy to prepare enough potatoes for a large group in no time. This is true of apples to, how many times have you looked at an apple and then thought, no i don't want to cut it up? Spiral cut apples are easy to eat. The varying blades allows you to get creative adding a design like seen above. This is a fun way to get kids or adults to eat their fruits and veggies. Margielynn, I love it, I cut apples up in no time. I am a foodie so I love cooking gadgets! I have been looking at this spiral slicer for some time. I think you just talked me into buying one! Thanks for all the great information on what you can do with it! katiem2, It's a way to get everyone eating their vegetables what with the wonderful shapes, like the cucumber slices at the top of your article. Is it easy and safe for incipient but under-aged chef wannabes in a household? This looks like something I could use. Yesterday, I bought a platter of vegetables already washed and cut up. How lazy is that?! Learn everything there is to know about cooking with cream.